Managing customers is essential to not only the initial selling, but upselling also. They play a pivotal role in the sense that if they have created an account on your website, they are clearly interested! A customer will need to create an account in order to buy, in cases where a customer has abandoned the cart, you will want to contact them to find out how. 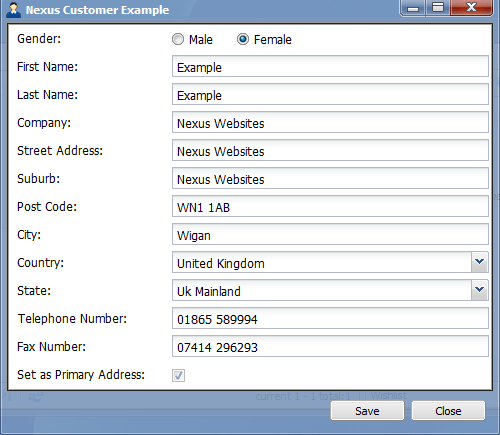 In order to do this select the edit button on a customer’s address book and it will display the information as currently seen to the right including telephone numbers. Customers will inevitably abandon the cart and it’s how you go about dealing with that. Please read more on abandoned cart below to understand how to utilise that module. The ‘Fax Number’ field is in fact the mobile field, so do not hesitate to ring that number!